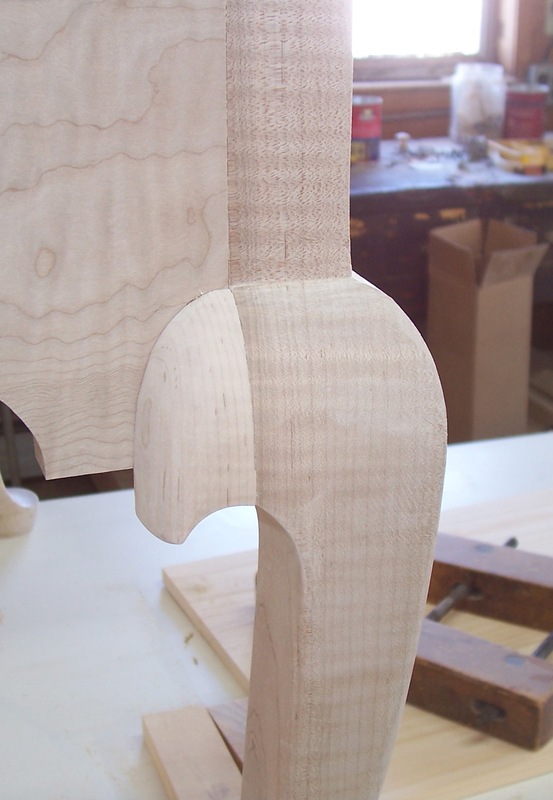 If you build Queen Anne or Chippendale furniture, you most likely have made cabriole legs. 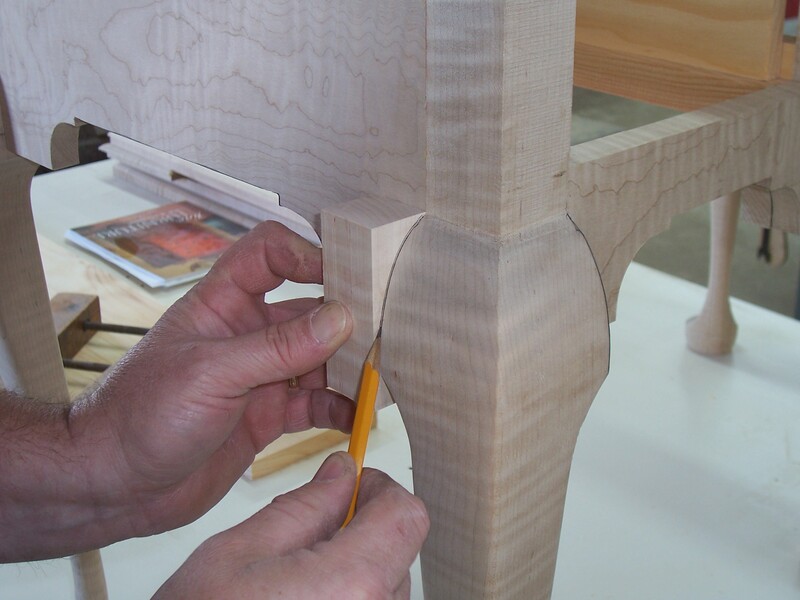 If you’ve cut and finished cabriole legs, you most likely have work on knee blocks. Or have you? Over the years, I have run into three methods used to address knee blocks.There are knee blocks that fit in front of aprons, those that fit under aprons and there are cabriole legs that do not use blocks at all. One habit I got into as I work on these curvy legs is to keep my cutoffs. The material you cut away from legs as you sculpt them from blanks perfectly matches the legs; the grain is right and the color is right. That’s the best material to use for your knee blocks. In the opening photo you can see the first step in knee block fabrication. There are a few things to remember as you work on blocks. In the Massachusetts High Chest of Drawers DVD (the piece shown in the first two photos), the apron is behind the block. (You don’t, however, attach the blocks to the apron; they still attach to the legs.) As you make these leg add-ons, it’s important to match the grain. That can be difficult. As you profile the knee blocks, each time you complete a step, the grain changes. When you make the cut to the pencil line in the photo, the grain moves. As you round the piece in the second step of the process, grain moves again. You need to be able to read the grain as it appears in the finished blocks if you want to achieve the perfect appearance when you’ve completed the work. As you also see in the above photo, color matches are important – I didn’t do so good on that task. Some blocks fit under the apron, as seen to the left in the cover project from the June 2010 issue of Popular Woodworking Magazine (#183). The importance of grain matching in this instance is the same. Even though the block fits under the apron, it still attaches to the leg and the grain should match. If the look and fit are correct, the connection appears seamless. That’s what you’re after. This week I began building the Connecticut lowboy – and as always with me, I began with the legs. And I saved the cutoffs. As I got into the legs a bit farther, I realized that I didn’t need the extra material because these legs did not have knee blocks. What the maker did was round the material from the front of the knee to the inside edges. If you look at the legs straight on, you almost see a half circle as you view from the right side of the upper leg to the left side. It’s interesting when you first see it. What struck me the hardest was that I was in the shop for about eight hours – probably worked for maybe five hours with all the talk and lunch – and two shaped legs was all that resulted. I could easily get all four legs complete a decade ago. I was reminded that my earlier shop was air-conditioned and working in the heat was most likely the cause for my lack of completion. Yeah. I’ll go with that. In my mind, though, I know it’s simply age.